Inkjet Plotter Paper sheet size and Roll Size Chart 22,24,30,34,36 Wide Plotter CAD Papers Roll in Standard American Archi tect Sizes Rolls, Sheets & Media Sizes class #1 – Perhaps first thing that may come to mind for someone learning about plotter paper and hearing the words, “Paper rolls”, identify atm machines, pos equipment. The quality depth printing difference between the technologies is a copy volume technology of importance yet our papers supply deeper fibrous tissue that has been color inkjet coated and processed for American use.Printing Inkjet Plotter Media depends more on the material and your desired outcome.. Today’s wide-format printing technology allows us special made and specific size high-quality roll of plotter printing paper media. A wonderful home made tool to be used in a project you can be assured something is about to be created. Lets start here about the difference between UnCoated and Coated Plotter Media – Rolls Inkjet Bond Paper. Something like 80 gsm, basis Weight (17×22/500), 20 lb or 20 lb’s – lands wide 24″ Format Plotter CAD Papers are good here. These 20# Paper, 20lb Paper. All assessed papers in accordance to Popular sizes in paper roll availability. It is true – we are now moving at such a QUICK revolution in creative polymer printing media materials are the 11 in, the 13 in, the 18 in, the 19 in and the 24 in. 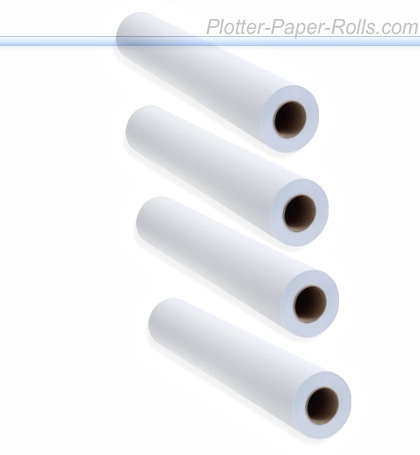 Plotter paper rolls, have two categories to which they could be immediately categorized. Those categories are best defined by the core size of the paper roll. You have two choices (hence 2 categories) = 2 inch core (for Inkjet plotter paper rolls) and 3 inch core (for engineering plotter paper rolls). “Inkjet plotter paper rolls” (which have a 2 inch core – the core is the hollowed out center which the roll is healed by the machine) . 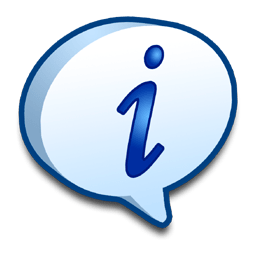 The Plotter Paper Roll standard sizes for the “inkjet plotter paper rolls” are the 11″, 17″, 18″ the 19″, 22″, 24″, 30″, 34″, 36″, 42″ (or Wide Paper Rolls Sizes 24″ 30″ 34″ 36″ 42″)and for largest jobs you can find plotter paper rolls sizes 44″, 50″ 54″ and the 60″. 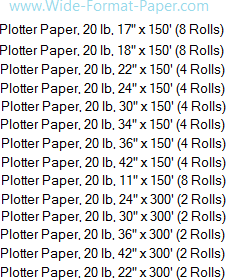 Plotter Paper Rolls for 2 inch core Inkjet machines come in standard sizes of 150 fee rolls – 300 foot rolls (average sizes). Imagine the weight of those rolls when packed together. You can hear our warehouse agents saying. “Roll that skid of rolls over here“. That in itself is nearly not easy to gather a mental picture. Yet we grow up in society, programmed. If we were to see a stack of rolls tied together on a palette, “Paper Rolls” may be a good way to communicate what you see. Now we think about the 3 inch core plotterpaperrolls. Most commonly called “Engineering Bond” or “Engineering paper rolls” the first glance difference is the larger 3 inch core on both ends of the roll which is where the plotter paper roll is healed by the machine. Three (3) inches were first used in Xerox plotter/printers. Rolls for a Xerox machine mainly used by Engineers for creating large amounts of Engineering Copies (hence the name of the machines used with this paper have become called by today’s popular name “Engineering Copiers”. The 3 inch roll was a brainchild of Xerox yet today many companie s make 3 inch core size Wide-Format copiers, printers and plotters and they have each picked up the American paper idea of large 3 inch core paper to go in those machines. Most of the plotter paper rolls we use today is all made in America by Americans and often the name brand of the company that made the machine which your office uses has purchased this standard size, quality, American paper and then they resell it to you often as the prime character that keeps your machine producing great prints. Here is a recap: Below are standard sizes and the amount of rolls that come per one box (or unit) for Inkjet Plotter Paper Rolls made in America and for use in all Inkjet 2 inch core machines. What are the Different Plotter Paper Sizes? Plotter paper has many uses. More often than not, it is industry specific. Those in the field of interior design cannot do without plotter paper. The same is true for architects, engineers and those in the building industry. It is easy to spot a plotter paper. It is usually white in color and has tiny squares which represent fractions of one inch. The reason for this is to make it simple for architects and engineers to enlarge what’s on paper and turn an idea into reality. Because of its use, plotter paper also comes in different sizes. If you think to yourself ” Hmmm ok – i know that Architects have their own paper size and there are a few different versions and i know Engineers have been the same way about their paper sizes – yet what i really mean is what are the standard sizes that plotter paper is delivered in so that the Architects and Engineers can use it, print on it and cut, fold, it to deliver the sizes they need.” – NOW you are at the point of understanding why sizes of plotter paper media is the size that it is. Ok – here goes…… Starting with HP plotter paper sizes: the media and paper that is used for Architects and Engineers has to be so pliable that it can be manipulated into presentations or schematics they can use and share. You will find the smallest most common roll size that HP Design-jet users and other HP printer technicians use is the 24×150 HP Designjet paper size – it is a universal size in which the technician can carry it around EAST yet there is enough room to get the point across. That is 24 inches X 150 ft roll – often the preferred roll it is called 24″ x150′ HP Designjet paper roll or 24″x150′ HP Designjet plotter paper roll – or, ha ha , 24×150 plotter paper for HP Designjet. Why is it that certain inkjet coated rolls work best with HP products? I try and keep in mind that, for the most part, HP designed all of this and it works so why try and fix it ? It was Xerox and HP that began the idea of proprietary size paper… for Engineering plotter paper 3 inch core is used also by people in the industry. For printer owners, they often use inkjet plotter paper 2 inch core or the HP design plotter paper. Canon Plotter Paper is also often in demand. Hewlett Packard and Canon are among the favorites because they are trusted and established brands. However, buying another brand of inkjet plotter paper sizes often works pretty well. So why do people need different plotter paper sizes? Well, one of the common reasons why engineers, architects and interior designers are very particular is because of the size of their printer. Plotter paper compatible printers often have minimum and maximum sizes. Naturally, you need to choose a paper size that fits your printer. Another common reason is the size of the room that is being planned out. The bigger the room, the bigger the plotter paper size that you need in order to replicate it. Again, plotter paper is used because the little squares help professionals enlarge the plan and turn it into reality. Plotter paper usually comes in rolls instead of sheets. Engineering plotter paper sizes are usually 8.5 x 11 inches, 11 x 17 inches, 17 x 22 inches, 22 x 34 inches and 36 x 48 inches. Among the plotter paper roll sizes, it is best to choose one that is compatible with your printer. Of course, you also need to consider how it will be used. 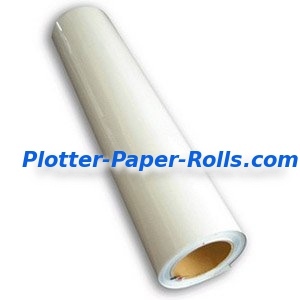 Plotter photo roll and plotter translucent paper rolls are also available for specific purposes. Finding the Perfect Plotter Paper Size is fairly Easy. You can either go to your nearest bookstore or just check for the specific plotter paper roll sizes that you need online. If you want to play it safe, go for Canon plotter paper or HP Designjet plotter paper. Because it is branded, you can be sure of its quality. If you are an engineer, an interior designer or an architect looking for plotter paper, it is essential that you choose the right size in order to help you really plan out a particular space and put everything in perspective. Depending on your style and how you will use it, you have the option of getting regular plotter paper, the vellum type, the plotter photo roll or the plotter translucent paper rolls. With it, you can give the client an overview of how a particular space will look like on paper. Richard R.